As I’ve studied bacteria in the lab for over 10 years, let me first explain a little bit about the bacteria Clostridium difficile (or “C. diff” for short). C. diff bacteria normally live in healthy intestines, however, antibiotic use can cause C. diff to overgrow and make you sick. The resulting C. diff infection causes inflammation of your intestines (you may have heard the terms antibiotic associated diarrhea (AAD) or C. diff colitis). Standard C. diff treatment protocols are usually the antibiotics metronidazole or vancomycin. Some strains of the C. diff bacteria are not responding to antibiotic therapy and are a growing cause of concern around the world. Unfortunately, repeated antibiotic has been reported to greatly increase your chance of recurring and debilitating C. diff infections. Find out how you can become free of C. diff colitis using safe and effective C. diff treatment methods your Doctor won’t tell you about. 5 Things your Doctor won’t tell you. Antibiotics – are they worth the risks? Are your cleaners causing you more harm than good? What is C. difficile and should you be concerned? Will antibiotics guarantee you’ll get rid of your C. diff? Are natural home remedies successful in stopping C. diff? Stop your C. difficile infection quickly. Repair the damage done to your body. Make your body resistant to future C. diff infections. Michelle’s unique blend of scientific and natural health experience has helped empower others to understand and overcome challenging infections. Her recovery programs are a global best seller. Fill in the form below to get our C. diff. 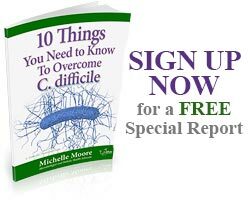 tips newsletter and your free report “10 Things You Need to Know to Overcome C. difficile”. 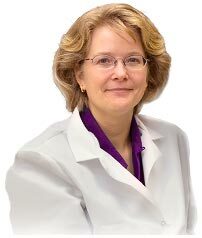 Listen to Michelle Moore’s recent radio interview where she reveals what C. diff. is, why it’s so dangerous and how to overcome this superbug infection. 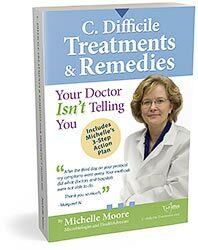 Michelle’s books and website resources have assisted thousands of people in understanding the numerous tools and approaches that are available to help overcome chronic infections. *Medical Disclaimer: Michelle Moore is not a doctor or health care practitioner, but she is someone who overcame many health obstacles that traditional medicine could not solve. This information is based upon Michelle Moore’s scientific research, education and personal experience and it is for educational purposes only. Information in this website has not been evaluated by the US Food and Drug Administration (FDA). This information is not intended as medical advice, diagnosis or treatment. Always seek the advice of your physician with any questions you may have regarding any medical condition. The company website and emails may contain affiliate links and Embrace Health Inc. may receive commissions associated with purchases you make on subsequent websites. Copyright 2010-2019 C-Difficile-Treatment.com. All rights reserved.